If you have had a chance to shop mega supermarkets in other states, then you have experienced the buying power these large chains wield: Publix in Florida or HEB in Texas, for example. Prices may be low, but since their distribution networks are constantly working in mind-boggling quantities, they rely on the largest producers to grow and deliver the goods. 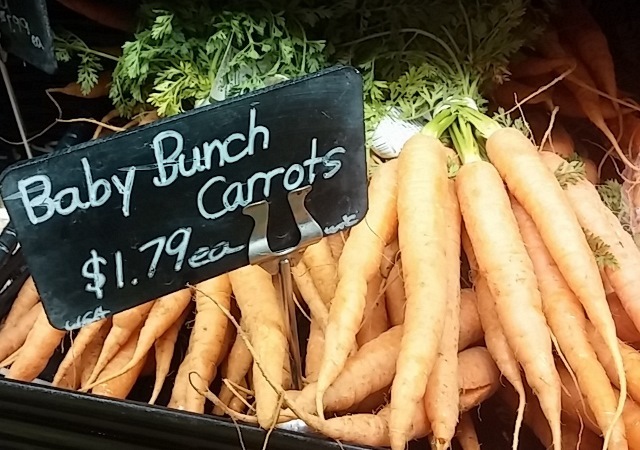 At a mega market, meeting the person that grew your herbs or picked your carrots is like winning the lottery. 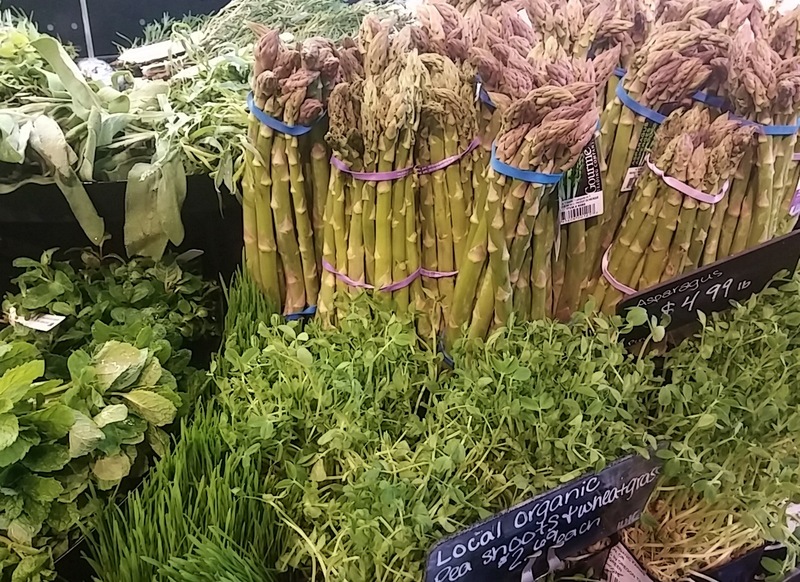 But even in sprawling metro areas, that possibility does exist when you seek out local markets with local connections and farmers’ markets where growers stand behind the food they grow. As with farm stands in more rural areas, you can meet and talk with the real faces actively involved in the growing process. They are committed and they know that a happy customer will return. The same is true with small batch bakers, artisans, craftsmen, and local markets vested in supporting local growers. In Oregon, we are fortunate to have a reliable group of independent grocers who make it their business to know and support local producers. There are many, but in the mid-Willamette Valley, Roth’s has been taking care of their neighbors since 1962. 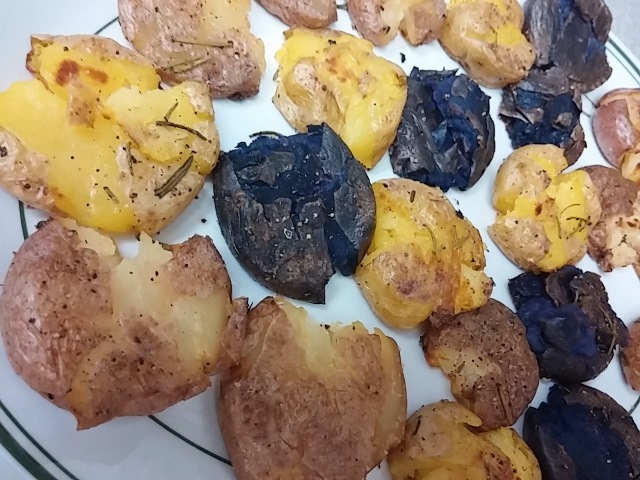 A recent find at our neighborhood market: colorful creamer potatoes. 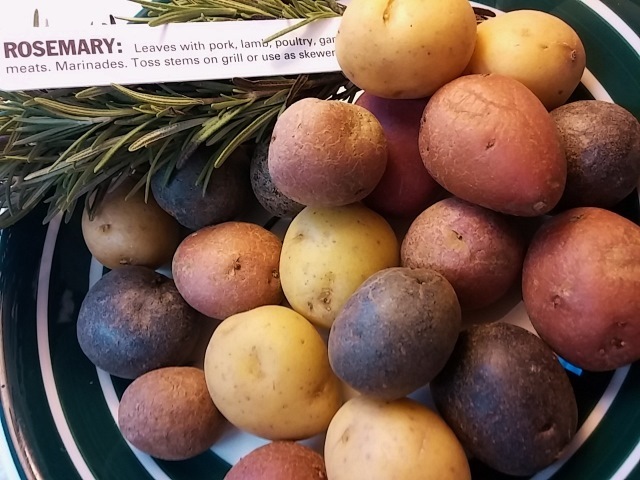 Available pretty much year round, red, purple, and white creamer potatoes are young immature potatoes averaging about 1″ in diameter. They are thin skinned with a high moisture content yielding flesh with creamy texture and flavor. Just in time for Super Bowl 50, these smashed creamers were a big hit: informal individual bites, perfect companion to chicken wings and other hearty snacks. Dab a little blue cheese dressing on top, if you’ve included it! Place the potatoes in a pot of salted water to cover; bring to a boil over medium high heat. Cook until tender when poked with a fork, about 20 minutes. Drain and let the potatoes cool, then pat dry and toss lightly with olive oil. On a cutting board, flatten with a chef’s knife or small flat pan.